Bite-Sized: Chapel | Wake up, Meeples! Chapel is the second-fastest way in Dominion to purge your bad cards (only surpassed by Donate), and with a cost of $2, can be bought in the opening along with another fairly good card. Trashing cards in Dominion is really, really good; you almost always want to trash your ten starting cards and any junk your opponent gives you in order to play your best cards more frequently and make your deck more consistent. Even in the face of the most powerful junking attacks in the game, you shouldn’t have a problem staying on top of your deck with Chapel on your side. 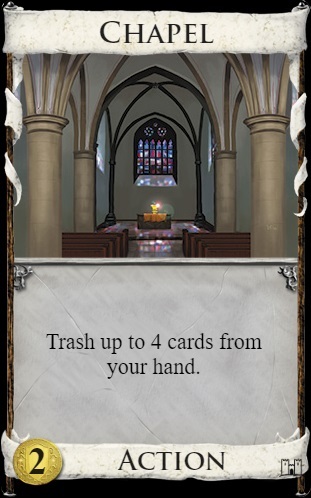 If you want a Chapel, you want to open with it and hopefully see it on turn 3 or 4; in almost every case, you’ll want to play the Chapel and trash your entire hand. Even if you’re just trashing Coppers and no Estates, this is almost always the best play because with these four cards out of the way, you’ll be able to line up your Chapel with the rest of your starting cards more quickly. The main exception to this is if you drew the other card you opened with — though this problem can be sidestepped by opening with a strong cantrip, which also reduces the odds of not seeing your Chapel before turn 5. The brief tempo loss you take from sacrificing a whole turn just to trash four cards will quickly become worth it when you’re playing lots of good cards each turn because you don’t have bad cards to get in the way. After playing your Chapel for the first time, you may want to be a bit more judicious about keeping a Copper or two around — make sure you think about having enough money in your deck to buy what you want each turn, as long as drawing your last one or two Coppers isn’t a huge pain — you may even find yourself planning one or two turns ahead, which is a luxury you’ll get much sooner with the trim deck Chapel gives you.